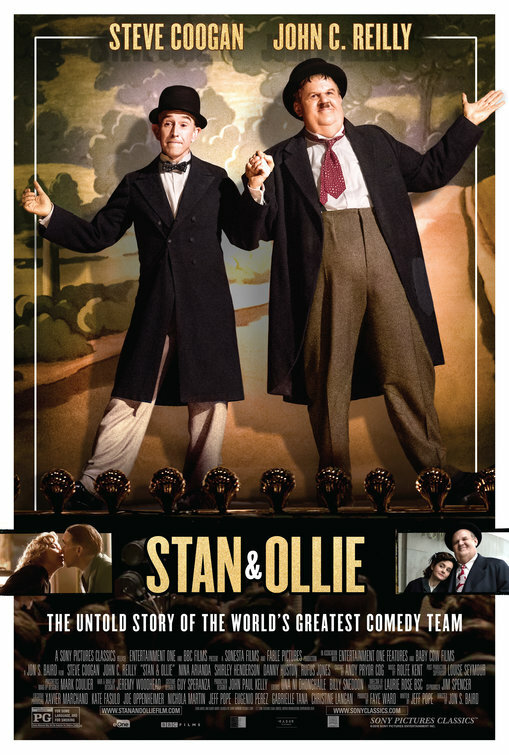 Synopsis: Laurel and Hardy, the world’s most famous comedy duo, attempt to reignite their film careers as they embark on what becomes their swan song – a grueling theatre tour of post-war Britain. Review: With a total of 107 movies to their name, the comedy duo Laurel & Hardy were kings of comedy in the late 1920’s through the late 1940’s, the golden age of Hollywood. While both men had established careers apart from one another, it was only when they were paired up at the famed Hal Roach film studio that their stardom went through the roof and they became the stuff of legend. Though they maybe aren’t remembered by name quite as much as the other comedic acts at the time like Abbott and Costello or The Three Stooges, it only takes seeing an image of Stan Laurel and Oliver Hardy and you instantly are familiar with their style of slapstick comedy. It’s surprising to me that the story of these two men has taken so long to get to the screen and now that it has it’s arrived as a small but sturdy film focusing on the later lives of the pair as they attempt a comeback tour through England in 1953. Far from their youth and out of practice with each other, the trip proves to be eye-opening in examining their personal and professional relationship and forces them to confront long-held grudges they’ve never really gotten over. With a career as long and varied as the one Laurel & Hardy had, screenwriter Jeff Pope (Philomena) was wise in focusing in on just one chapter in their story. The film buff in me would have loved a longer tale that showed us the early Hollywood years that led up to this comeback tour which proved to be the last time the two men would work together, but perhaps that’s too tall an order for a feature film and might find itself better suited as a series down the road. Pope traces the two men as their tour starts out small but gathers steam as the has-been stars get their spark back and begin to pack in theaters throughout Britain at a time when the country needed a laugh. Casting was crucial in pulling off this piece and director Jon S. Baird tapped the right people for the job. As Stan Laurel, Steve Coogan (Night at the Museum: Secret of the Tomb) has moments when he looks eerily like the gangly goofball with the flat face and slinking shoulders that stands in stark opposition to the somber fellow Laurel is painted as being offstage. John C. Reilly (Holmes & Watson) plays his counterpart wearing a fat suit and convincingly real latex prosthetic to enhance his chin and jowls. Though he doesn’t have the same ringer look that Coogan does, Reilly doesn’t let the make-up do the work for him (I’m talking to you Christian Bale in Vice) and brings the physicality of the rotund comedian out to strong results. The men are backed up by two ladies that often steal the movie right out from under them. Nina Arianda (Florence Foster Jenkins) is a hoot as Laurel’s brash Russian wife that hogs the spotlight and then there’s Shirley Henderson (Anna Karenina) showing quiet grace playing Hardy’s concerned wife. At 97 minutes, the movie feels longer than it actually is because it’s ever so slightly on the slow side. I hate to say it but it even devolves into a rather dull film around the halfway mark when it starts to fall into a familiar biopic formula where conflict is introduced in preparation for a reconciliation right before the credits roll. The period settings are spot-on and if you’re a fan of the duo then you’re in for some delightful moments where portions or their act are nicely recreated by Coogan and Reilly. I just wish the movie exuded the same kind of spritely spirit Laurel & Hardy were able to convey in their work.